After the vision screening at school, Nicholas’ parents learned he had a possible vision problem. His mom immediately scheduled a follow-up appointment with an eye doctor. After a full examination, the doctor prescribed glasses. His teacher had noted that Nicholas was having difficulty with his board work. After he returned to school with his new glasses, there was a big improvement. His teacher is very pleased with how well Nicholas is doing with his class work. 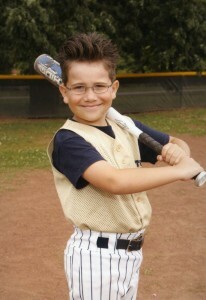 Nicholas loves playing baseball and is an outfielder. Before receiving his glasses, he had a difficult time keeping up with everything going on during each play. Now, with his glasses, he is playing very well and enjoys the game much more. Nicholas also enjoys reading and riding his bike.